Dr Chandra Ayer is a specialist in community child health, developmental and behavioural Paediatrics. 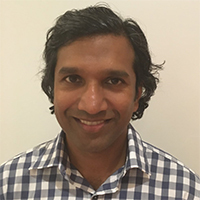 Dr Ayer completed his medical degree at the University of Sydney and his Paediatric training at The Children’s Hospital at Westmead with further training in Developmental and Community Paediatrics at the Kogarah Developmental Assessment Service at St George Hospital where he continues to work. Dr Ayer has completed a postgraduate degree in International Public Health and has research interests in universal developmental screening and developmental vulnerability. He is a member of the Neurodevelopmental and Behavioural Paediatric Society of Australasia.